SAO PAULO, April 18, 2018 /PRNewswire/ — Neymar Jr., one of the world’s most influential and widely-recognized athletes, today officially took up his new role as global brand ambassador for TCL, top-three global television manufacturer and leading consumer electronics brand. The young star footballer kicked off the brand’s 2018 global sports campaign at an event in his hometown of Sao Paulo. As part of his partnership with TCL, Neymar Jr. brings his star power and exceptional qualities to a wider, global community in order to bring the brand’s fans closer together. “I am honored to be Global Brand Ambassador for TCL. 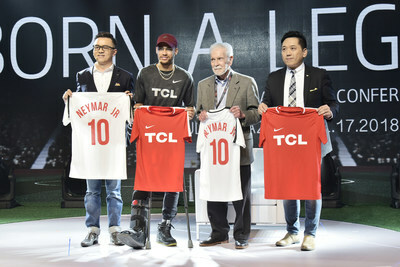 The brand and I share similar values, such as the constant pursuit of excellence and great results,” said Neymar Jr. “I am also impressed with TCL products featuring high-tech and intelligence upon first seeing them,” added Neymar Jr.
Neymar Jr. experienced TCL’s flagship QLED TV X6, TCL 4k UHD TV P6, TCL new all-touch anti-pollution washing machine, TCL integrated inverter & air-cooled refrigerator, T-Smart series air conditioner as well as TCL S800 Air Purifier at the event, and helped to co-launch a series of TCL x Neymar Jr. advertising campaigns. Recently, the company launched a large-scale outdoor advertising campaign with the theme “Born a Legend” and celebrated the partnership at global landmarks such as New York’s Times Square, Hollywood TCL Chinese Theatre and in locations across US, Mexico, France, Germany, Italy, Poland, India, Vietnam, Thailand, Australia and China. The company is soon to launch an exclusive video campaign with Neymar Jr. in which he experiences other elements of TCL’s extensive product portfolio, including TVs, washing machines, refrigerators and other home appliances. The partnership with Neymar Jr. is a key next step in TCL’s global brand strategy. The team-up allows TCL to reach a wider audience of young sports fans worldwide and will raise TCL’s global brand visibility, reinforcing the company’s youthful, international brand image. “Our vision is to build TCL into a global leader in smart products and internet services. We connect our consumers with enhanced technology leadership, and smart and intelligent product experiences and global partnerships that fit the brand,” said Kevin Wang. “Investment in sports and entertainment marketing activities is a major plank in TCL’s global brand strategy. Our other global sports partners include the NBA’s Minnesota Timberwolves and Lynx, the iconic Rose Bowl stadium, the soccer team San Jose Earthquakes, the Brazilian Football Confederation (Brazil), the Rosario Central Football Club (Argentina), the Philippine Basketball Association (Philippines), The Melbourne Cup and Melbourne Victory Football Club (Australia). We also work with entertainment industry partners including Hollywood’s TCL Chinese Theatre, The Ellen Show, and the popular Warner Bros. Pictures movie Justice League,” said Xiaoguang Zhang, General Manager of Brand Management Center of TCL Corporation. This latest partnership and expanded brand strategy reflect TCL’s accelerating growth and business vision. “TCL continues to consolidate and expand our TV business, while exploring new opportunities through investments, mergers, acquisitions and restructuring,” said Kevin Wang. “We plan to gain differentiation through continued high-end product strategy and innovative new products and applications to create a better user experience when compared with our existing products,” he added. In the next three years, TCL aims to build an eco-business enterprise based on the smart TV business, to provide users with exquisite smart TV products and services. TCL ranked top three in the global LCD TV market with a market share of 10.9% in 2017, according to IHS Technology and the company’s shipment data. As a global enterprise group, TCL Corporation, headquartered in China, founded in 1981, is a manufacturer of smart products and provider of Internet application services. Starting from the manufacture of recording tapes, TCL later developed telephones, televisions, mobile phones, refrigerators, washing machines, air conditioners, small appliances, and LCD panels, among others. In recent years, TCL Corporation’s main business operations have seen steady growth. For the last four years, its revenues have exceeded a hundred billion yuan. TCL has been a pioneer in the internationalization of Chinese commerce since 1999. It has already passed the stages of early exploration, transnational M&A, and steady growth. In recent years, facing the challenge of slowing Chinese economic growth, as well as the opportunities created by the country’s One Belt One Road strategy, it has reformulated its road map to internationalization. In the coming years, TCL will continue to consolidate and improve its market share in Europe and the U.S. through “three forces combined and brand leadership,” while also breaking through in selected important emerging markets like India and Brazil, taking root in the local markets and establishing competitiveness across the value chain. Internationalization will be the new driver of TCL’s future development.